Fine cigars encased in leather to protect and preserve. It’s an iconic, masculine combination that has been appreciated for well over a century. Leather is a pervasive companion to cigars and it’s tough to find accessories that are unique. However, at Best Leather, we have found a designer who is creating stylish, unique cases for cigars. Tox Leather, owned and operated by Eser Dasdemir, is based in Istanbul, Turkey. Tox Leather was established in 2013 after Eser had been designing and making designs for years as a hobby. Eser is dedicated to creating 100% handmade leather items – all hand cut and hand sewn, from animals used for human consumption. Tox Leather does not use any type of exotic leather and is an eco-friendly operation. Eser creates tobacco accessories, electronics cases, personal accessories, and bags. The Tox Leather Stylish Cigar Case comes in thick, brown or black cowhide leather and comes in two sizes – robusto or double corona. My case came in brown and is very pleasing to the eye. Eser has also done a nice job of tastefully placing the Tox Leather logo on the flap. This horizontal style case is capable of several different sizes of cigars and in various numbers too, making it a great case to use if you’re planning to share a few cigars with your friends. It’s made from three pieces of leather. The flap, which is also the back piece of the main case, is turned over to utilized the rough-out portion creating a two-tone affect to the case. The simple slip through strap secures the case closed with a sturdy snap. And, it’s expertly hand-stitched. The Tox Leather Binary Cigar Case also comes in thick, brown or black cowhide leather. And, it’s available in two sizes as well, robusto or double corona. My case is black and has a very classy look to it. It beckons you to fill it with quality cigars. This is a vertical style case and is capable of 2-3 cigars, depending on size. It will easily accommodate two cigars in tubes. Again, this is a great case to carry if you’re planning to share cigars with other people. It too is made from three pieces of leather. It does not use the rough-out side of the leather, instead completing the exterior profile in a deep, rich black smooth finish. The strap is reversed giving the piece additional character with the rough-out displayed. Again, it just adds a little pizazz to the case. It too is crafted from three pieces of leather and hand-stitched. Both of these cases are sized and shaped well. Even though each will hold multiple cigars, their profiles are still fairly slim. I believe they will travel without difficulty in the chest pocket of a blazer or suit coat and certainly will not take up much space in a briefcase or messenger bag. There’s one very small thing that I wish could be changed on both of these cases. The strap used for closing and securing the cases hangs below the case just a tad too much. I know, that’s really a minuscule issue – but for me, I wish they were trimmed just a tad shorter by perhaps a quarter of an inch or so. In trimming the strap down just a bit more, it would fit more easily in a coat pocket or come unsnapped by inadvertently if snagged. One thing that impressed me with Tox Leather right away was presentation. I opened the package to find nice, burlap bags emblazoned with the Tox Leather logo. Inside were natural colored paper bags that contained the cigar cases – each with stylish tags on them with the Tox Leather logo. It’s just an impressive way to receive your products and says a lot about the pride of workmanship Eser has in Tox Leather’s products. I’m unsure of the leather source and thread source, but in examining both, they are of high quality. These two cases are very eye-catching. I think they are equally attractive and impossible to say that the brown case looks better than the black case. I’m definitely looking forward to pulling these cases out when I get together with a few of my buddies. I know that they’ll instantly be envious. – that is, until they order their own. If you’re a cigar fan, then you know there is a myriad of accessories out there – including cigar cases. What’s always refreshing is to find an accessory that’s unique, at an attractive price point, will perform well, and last a long, long time. At $76 for the Tox Leather Binary Cigar Case and $86 for the Tox Leather Stylish Cigar Case, they definitely tick all of those boxes. When you pull one of these cases out at the next gathering at your local cigar bar or in the backyard of a buddy’s house – it will get noticed and appreciated. 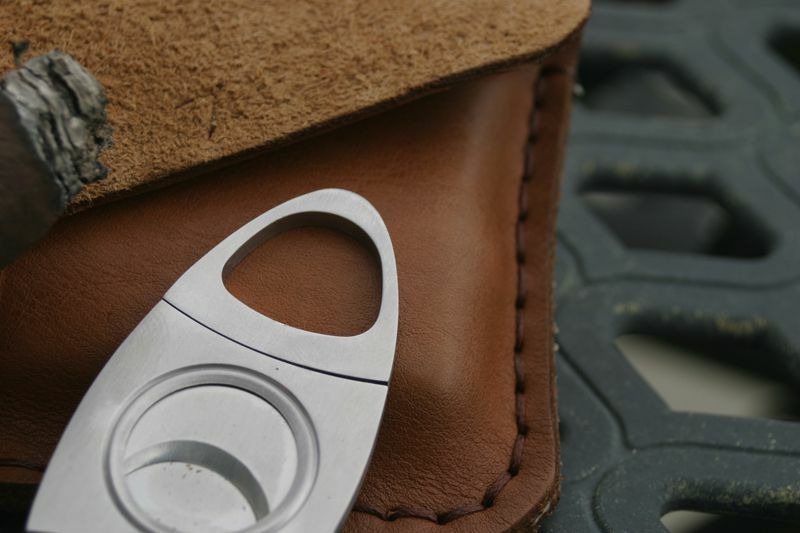 4 Comments on "Tox Leather Cigar Cases – $86 & $76"